A CDOT rendering of the I-70 reconstruction project. The aging I-70 viaduct in North Denver is nearing the end of its usable life. For 50 years the bridge has hovered over and divided the Globeville, Elyria and Swansea neighborhoods at the confluence of Interstates 70, 25, and 270. "We've done all the fixes we can do on this bridge to keep it standing," said Kirk Webb of Colorado's Department of Transportation. Now the question becomes, what do you do to replace it? KUNC's Nathan Heffel reports for Morning Edition. "We developed the partial covered lowered alternative in response to community output," Webb said. "There was a neighborhood group that asked us to tunnel all the way through the neighborhood. And we couldn't figure out how to do that." CDOT's Webb stated they did figure they could lower the Interstate and place the covered section near the Swansea Elementary School. But Thad Tecza a senior instructor emeritus at the University of Colorado Boulder isn't convinced CDOT's plan is the best course of action for the neighborhood, or the community. "The highway devastated those neighborhoods when it went through in 1964," he said. 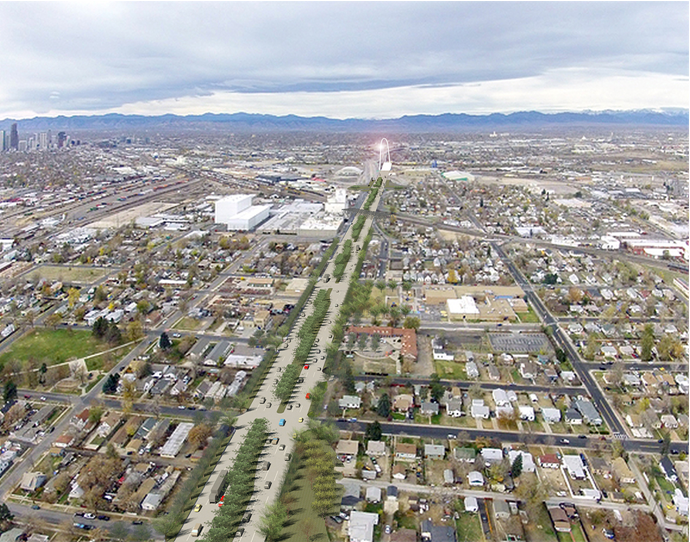 "Somehow [CDOT] is arguing that tripling the width of the highway and simply covering less than 10 percent of it they're going to reconnect the neighborhoods. That is absolute myth and a fiction." A rendering of the I-70 proposal by United North Metro Denver. Tecza represents United North Metro Denver, a group opposed to the project. In fact, he's advocating for the complete removal of the interstate for nearly 6 miles, rerouting traffic north along I-76 and south on I-270 – around the neighborhood. I-70 would be replaced with what he calls a tree lined boulevard. Tecza said other cities like Milwaukee, Los Angeles and Oklahoma City have removed freeways from highly populated urban areas before. "And every city that does that they find that the level of traffic congestion goes down, property values go up, neighborhoods are knit back together," he said. Not only that, but Tecza said the current proposal by CDOT to expand the freeway to 10 lanes is based off an outdated formula for future traffic congestion. "There are studies that show that for the last decade, per person driving miles both nationally and in Colorado are declining as the population ages, young people drive less, there's more urbanization," Tecza said. CDOT said the population in the area is forecast to increase by 41 percent by 2035. The agency maintains its plan for lowering and widening the highway to 10 lanes maximizes Interstate 70's ability to handle possible traffic increases, while minimizing disruptions to the neighborhood. Denver City Auditor Dennis Gallagher thinks there's room between the CDOT plan and the proposal by United North Metro Denver – at least when it comes to the widening of I-70. "We don't mind the lowering of the road so much, although I hope that reason will prevail and they not go to 10 lanes," said Gallagher. Instead, the former State Senator who served the Globeville, Elyria and Swansea neighborhoods for 20 years believes that shrinking the footprint of I-70 in the neighborhood will free up vital land. In turn that space could be used for revitalization and redevelopment. CDOT's Kirk Webb believes there are no easy answers for the aging elevated section of I-70. With so many differing interests dependent on the highway and its redevelopment, he said no plan will solve all the problems facing the neighborhood or the surrounding area. "We've looked hard for that perfect solution and it just doesn't exist, there's going to be trade-offs," Webb said. "But the benefits are that there's a cover and the freeway is gone from your visual field." CDOT is in the process of holding a series of meetings so the public can weigh in on the proposed I-70 plan.The public comment period ends at the end of October 2014. The agency will then submit a final environmental impact statement for federal review. That could come in late 2015 with construction possibly beginning around 2016 or 2017. Both well-known and blighted, the Globeville/Elyria-Swansea neighborhoods just north of Denver are in for some big changes. The ambitious projects will potentially cost billions of dollars and significantly transform the community. Residents hope the revitalization won’t come at their expense. The next time you’re driving along I-70 in the mountains, you may think you’re landing on a runway. That’s because the Colorado Department of Transportation is testing new in-pavement LED lighting. An 18-month construction project to replace the Highway 14 bridge over the Poudre River in Fort Collins may cause traffic headaches. The detour will begin Tuesday, Sept. 23 at 7 p.m.
Work has already begun to replace the bridge, also known as the Mulberry Bridge in Fort Collins, but the yearlong traffic detour it will require has many motorists worried. The massive September floods of 2013 tore houses from their foundations and washed away roads as if they were made of sand, not asphalt. While the Colorado Department of Transportation was able to re-open all damaged roads before Dec. 1, 2013, those roads still need a lot more work before they will be able to withstand future floods.